Natallia studied soil sciences and agrochemistry as part of a five year agricultural degree programme. After graduating she spent a number of years working on farm, before joining PlantWorks in 2009 where she focused on mass production of mycorrhizal fungi. 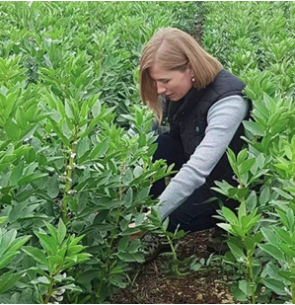 In 2014, in support of PlantWorks decision to develop a farming proposition, Natallia took on the role of arable farm trials manager and has become an expert in beneficial soil microbes and their use as inoculants in farming systems. In her role as a Technical and Arable Farm Trial Manager, Natallia remains involved in the research activities at PlantWorks as well as working with farmers and agronomists, sharing her knowledge on the uses of Arbuscular Mycorrhizal Fungi (AMF) and nitrogen fixing, Plant Growth Promoting Rhizobacteria (PGPR). Natallia looks forward to meeting with you at the SMART ROTATIONS stand to discuss your farming system and how you can manage your land to enhance the biology of your soil to increase your plants’ efficiency at using your applied fertilisers.